If there is one major aspect of writing the self then it is located between seeking independence and experiencing interdependence . The entire history of Anglo-American Modernism has been the formulation of the work of art and literature as an autotelic object, or an independent being initself , quite distinct from the interdependency that constitutes raw life. Writers like James Joyce, Virginia Woolf, and Marcel Proust desired independence from all and everything — including culture, family, and language — and the great illusion of the irreplaceable uniqueness of the individual — one of Europe’s finest illusions — blossomed forth. The aesthetic of the Modern was conceived in such a desire to be independent. Nevertheless in the contexts of writing that has changed over the years, multicultural issues and pluralistic perceptions in the fast lane of life in the present have altered the concerns of the evolving narrative self as fully evidenced in Gish Jen’s exploration of her own writing and the cultural phenomenon of literature in America. Gish Jen is a writer living in Cambridge, Massachusetts. She is the author of four novels including the acclaimed Typical American andWorld and Town . 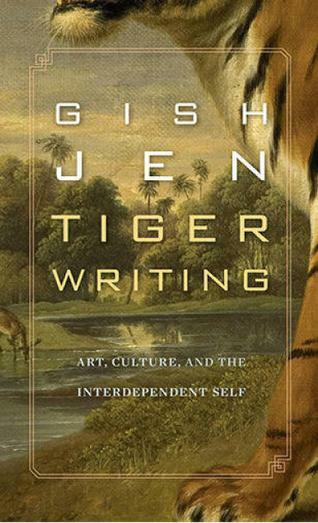 Gish Jen’s Tiger Writing: Art, Culture, and the Interdependent Self , is a three-part lecture she delivered as part of the Massey Lecture series in Harvard. The forum obviously offered for this second generation Chinese writer in English a specific reason to delve into herself and close-examine her own cultural and literary situation. The book is thus a testament and a manifesto for interrogating the closure of the self in the context of the West and the cultural necessity of opening up to the larger issues of interdependency in a globalising present. In his essay Why I Write , George Orwell confidently gave “four great motives for writing” that he feels exists in every writer. The first of these is sheer egotism — to be talked about, to be remembered after death etc. The second is aesthetic enthusiasm — an investment “in the impact of one sound over another, in the firmness of good prose or the rhythm of a good story.” Then there is historical impulse — the “desire to see things as they are, to find out true facts and store them up for the use of posterity.” And finally, political purpose — a “desire to push the world in a certain direction,” which he finds in every person. For Gish Jen there is another motive: the fascination with the western narrative per se . She discovers that the novel is fundamentally a western form, and her fascination with the classics of modernist writing she had encountered even from her childhood helped her locate the narrative strands as drifting toward a sort of narcissistic solipsism, as quite distinct from her own Chinese roots that she soon identified. Tiger Writing is a remarkable achievement on account of its sobriety and unique perception of difference between what Gish Jen considers as the West and Asian narratives. The novel needs to be located within the ambit of anguish and joy and not constrained in terms of a narrow self-exploration as she desires. Growing up in America as the second daughter of a Chinese immigrant Engineer, Gish Jen was well exposed to the wealth of classical modernist writing. Eventually with her discerning critical eye she was able to discriminate the appalling casualness of pronouncements like Lionel Trilling’s about how Thomas Mann “said that all his work could be understood as an effort to free himself from the middle class, and this of course, will serve to describe the chief intention of all modern literature.” With a characteristic Chinese clarity recalling Confucian insight, she dismisses this as ever being true of all times despite the special evocation of the radical political agenda in both Mann and Trilling. Further there is a distinction in the interior exploration of Mann and Kafka and eventually Milan Kundera as she discovers. Gish Jen cites Kundera: “For Proust, a man’s interior universe comprises a miracle, an infinity that never ceases to amaze us. But that is not what amazes Kafka.” It is the involvement with history that discriminates the Kafkaesque. Gish Jen’s thesis is that there is a distinct trait to individualism in the aesthetic of the West, while its Asian counterpart is one that liberates the self from its own mundane-ness through its involvement with the everyday and the rest. Individualism intensifies from the East to West, as pointed out by Richard Nisbett, she says. Gish Jen, we must remember, is a second generation Chinese American western writer — and she thinks critically and thinks at times in terms of even us and them . However her sensitivity to her own roots and the transparency with which she focuses on these textures is what makes Tiger Writingremarkably interesting. The book as we have it now is divided into three sections, and the first section is entirely devoted to her father’s autobiography which he wrote when he was 85. Here the focus is entirely on non-episodic experiences and what we could term as personal history. The items described are external objects and the narrative reads like a map of external experience. And stood in the light, las ing his tail. This element of surprise and discovery that takes place in a work of art that leaps straight at both the reader and the writer is in the end that which matters, and Gish Jen’s translucency as a novelist with an astute critical sense is that which leads us through the pages of this extremely interesting narrative. Tiger Writing is thus at once a text of critical exploration and a manifesto.